Set on top of the Parque Eduardo VII this michelin-starred Restaurant has one of Lisbon's most unique views. The buidling is stylish and perfect situated - from outside it doesn't look like a restaurant. When you go inside you have the chance to enjoy a minimalistic yet fashioned ferniture. White sleek chairs opposite huge window walls facing the city. The hostess accompanied us to a place in the corner. Starting with a glass of sparkling wine, the evening began pretty good. The first amuse-bouche was a variation of Portuguese delicacies: a sardine with a kind a chilli dip, a fried chicken ball and fish tartar. The second amuse was a fish filet with mussles and fresh herbs. A trio of tuna was the first course, grilled, tuna tartar and raw tuna covered in sesame. While the carrot soup itselves was a bit boaring the fish and the cam, which we don't exactly know what it was, were refreshing and really good. As a main course we got a grilled pork with a crust served with orange sauce, tomato puree amd potatoes. The pre-dessert was kind of a sour cream, yoghurt ice cream with a fig. 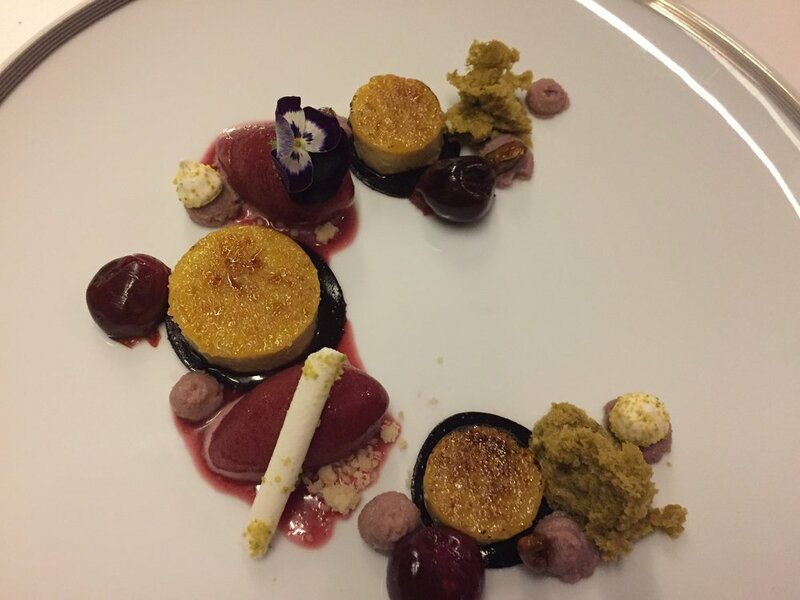 A crème brûlée served with cherry sorbet, pistachio and pickled cherries. The last course was a variation of Portuguese chees with a dried apricot. Finally we were served petit-fours, which were really good. All courses were accompanied by perfect wines. During our stay in Lisbon we learned alot about Portuguese wines. The young service team was very friendly and attentive. The dinner was sponsored by the Eleven Restaurant. However this review has not been influenced and expresses our own opinion.